It looks like celery juice is a food trend this year. I’ll pass. However, I do have an green food option for you if you’re into that sort of thing, except this option is delicious. I’ve had a lot of spinach pie. Being Greek, that’s to be expected. 😉 If you asked 10 people to make it then I bet you’d get 10 different varieties. I’m sure most, if not all, would be delicious in their own way. When my husband and I visited Greece several years go we had a spinach pie in a spiral form at a truck stop for a few Euros. That spinach pie turned out to be one of our favorite meals from the vacation. I had never made my own spinach pie until last year. I opted to not make my Yiayia’s (grandma’s) version or my mom’s, but they were part of the inspiration for my own creation. I made a 2 serving spinach pie in a loaf pan for my me and my husband to share for dinner. I was obsessed with it. It far exceeded my expectations. The filling was moist and tasty. While I love the 2 person recipe for just me and the hubby, I do not want to make 3 separate loaf pans at one time to serve a bunch of it at a family gathering. So I transformed the recipe to make it in a 9 x 13 pan and I cut the squares into smaller sizes, perfect for an appetizer or a side dish. You should cut the squares into bigger portions if you wanted to serve a vegetarian dinner for 4 to 6 people. 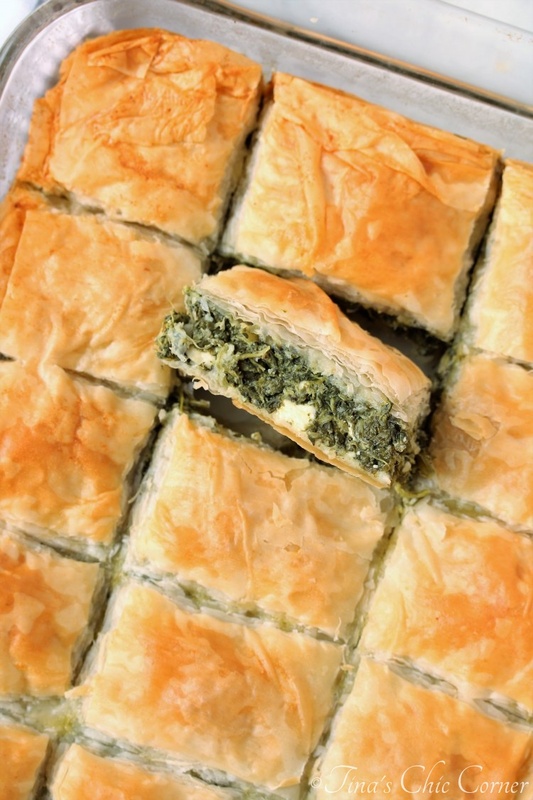 You can enjoy spinach pie hot, room temperature, or cold. I love it the best when it’s hot because the phyllo is nice and crispy. Look at all those buttery layers. Yum! Preheat the oven to 350 degrees F. Butter a 9 x 13 inch pan and set it aside. In a skillet, over low/medium heat, add the olive oil and finely chopped onion, and cook it until it’s slightly browned. Thaw the frozen spinach and squeeze out the water. I placed the thawed spinach in a colander and used paper towels to press the water out. You don’t need to squeeze it like you are trying to get back at a mortal enemy. Just enough to remove some of the moisture so that your spinach pie doesn’t get soggy. Add the spinach into the skillet and stir everything together. Remove the spinach mixture from the heat and set it aside. Let this rest to get to room temperature. In a medium bowl, mix together the egg, parsley, dill, salt, pepper, and feta cheese. Make sure that the phyllo dough is completely thawed. It is super fragile so if it is not, then it will break. In general, be extra gentle when handling each layer phyllo because it is so thin and it tears easily. 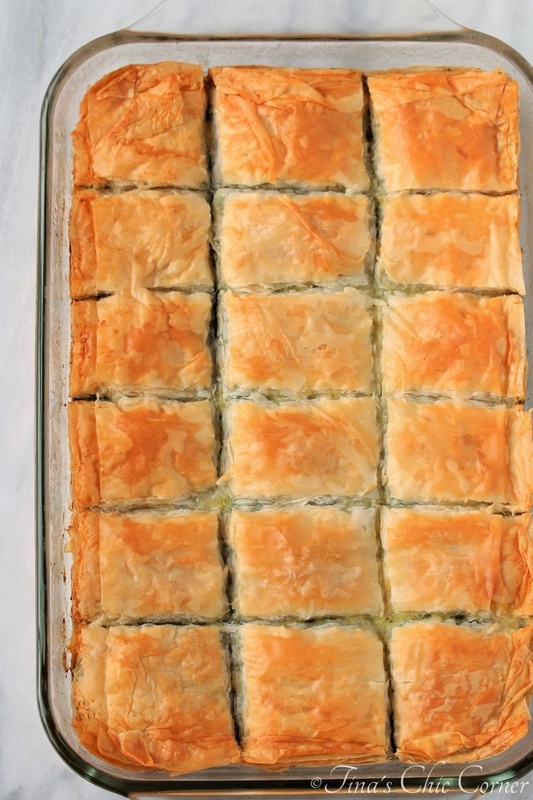 Lay 1 phyllo sheet into the pan and brush melted butter on top of the sheet and up the sides. Do this for 8 phyllo sheets. Add the spinach filling on top in an even layer. Lay 1 phyllo sheet on top of the spinach mixture and brush melted butter on top of the sheet. Do this for 8 phyllo sheets. Cut (or score) it into 18 squares (or however big you want the pieces) prior to baking. 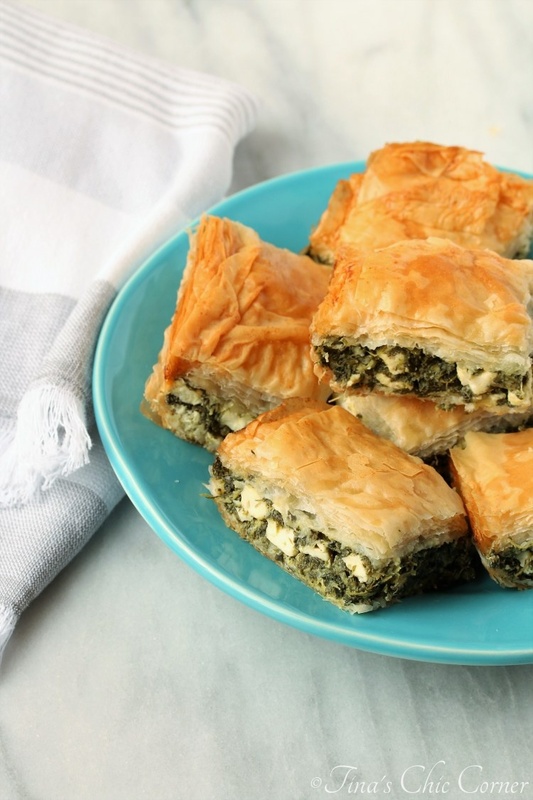 Phyllo is super fragile and crispy after it bakes, so this will allow you to portion it later without destroying it. Let it sit for about 5 minutes before serving. This made my mouth water, Tina. I wish I had a piece of it now.